The ultimate guide to Les Orres ski holidays in 2019 & 2020. Les Orres is made up of two villages: one old, traditional and oozing French alpine charm and the other brand spanking new with purpose built, doorstep skiing convenience. With snow sure pistes, a family-friendly atmosphere and plenty of events to get involved with, this is one of those places that once you’ve been to, chances are, you’ll be going back! Set in the middle of a forest with spectacular views over the Embrun Valley, Les Orres is split into two different villages which are identified by their altitudes, Less Orres 1650 and Les Orres 1800. The presence of two villages within one resort gives a huge choice in terms of atmosphere, accommodation and facilities, and free transport links between the two lets you explore the shops, restaurants and activities as much or as little as you like. 1800 is a new purpose built village, established in 2008 and has a number of really modern facilities including newly built apartments, outdoor swimming pools and childcare as well as doorstep skiing. 1650 is the older and indeed prettier of the two and offers a larger variety of restaurants, bars and shops plus a popular ice-rink. They’re a 20 minute walk apart and a free bus circulates between the two until 7pm. Across the two villages, there are 18 restaurants and 14 bars, with the majority being in the slightly livelier 1650. You’ll still find some restaurants and bars in 1800, besides a well-stocked supermarket, so no matter which resort you choose, you definitely won’t go hungry! The French tourist board have given the resort special recognition for its outstanding facilities for children by awarding it the Famille Plus label. The Les Orres ski pass gives you access to 100km of runs, allowing those of all abilities to do some great skiing or boarding. 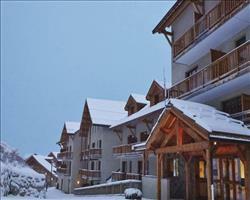 Both villages have fantastic ski links, with a variety of runs going right into the resort. As well as skiing and boarding, there are a number of other snow activities on offer. Children will love the snake tobogganing and the whole family will enjoy the alpine horse rides while thrill seekers should definitely consider a paragliding trip. View our detailed Les Orres snow forecast or snow report and see all live webcams, piste maps, road and travel maps and lift pass prices. For a picture of historic snow conditions see the snow depths month by month with our Les Orres snow history. The skiing is best for beginners and intermediates, as it offers a huge variety of green, blue and red runs. Children are well provided for by the friendly and super experienced team at Club Piou-Piou in 1650 and La Farandole in 1800. Beginners have a number of gentle greens - the Fountaine on the Bois Mean side runs right through both villages and connects with the green Eidelweiss. Once you’ve conquered these, take the Champs Lacas lift up for some high altitude greens and blues, like the Silene (the views are stunning on a clear day). Intermediates will really enjoy the reds stretching high above both villages. For serious altitude, head up to the Portette Peak at 2658m and take the Portette right back down to 1650. Alternatively, go towards L’Aupillion area to ski the Marmotte to 1800. For a really long scenic red, the Grande Caban is easily the longest run around. Experts will find a handful of blacks to satisfy adrenaline cravings. Head towards the Boussolenc peak and start out on the Ecureuil black that connects with a blue to ensure you don’t wear yourself out too quickly. Once you’ve primed your ski legs, take the TSDC Fontaines lift, start out on the Soldanelle red and move on to the suspiciously named Horrible run, for a real test of your nerve. With high altitudes and varied terrain, there’s a lot of off-piste to be explored. There are restricted areas on the map, so make the most of the powder in a safe way by hiring a local guide to show you all the best bits. The area also has 40km of cross country ski trails and the Snowpark des Orres, which has a variety of obstacles, including a boarder cross and regular slopestyle events. Whilst Les Orres is great for ‘things to do’ where events and activities are concerned, the après scene is pretty quiet. That said, as is the case for most things in life, if you want a party, you can definitely find it. 1800 is the quieter village of the two, but if you want a good meal, La Bouscatiere specialises in typical Savoyard dishes like tartiflette and raclette - their cheese fondue is a great choice. If cheese isn’t your thing, they also offer up a number of French delicacies, including foie gras and homemade bread. The Winter Bar has an extensive wine list and spirit bar, as well as tasty evening tapas. A short bus ride away before 7pm and a taxi ride after that, 1650 certainly has a bustling après-ski scene. For a relaxed drink or two, A Grande Cabane is the perfect choice - kick back and relax with a glass of wine, cold beer or cocktail from their extensive bar menu. Anyone wanting to party until the early hours has Le Spot in the centre of 1650. With a late night DJ and a great choice of drinks, from shooters to soft drinks, you can party until your ski legs can no longer hold you up. For a more sophisticated après, don’t miss the Salon de Thé overlooking the ice rink for some exceptional tea, coffee, hot chocolate and first class French patisserie. For a really yummy evening meal, the Cote Terroir is a cosy and welcoming French restaurant with a wealth of homemade French dishes. They also have a shop on the side, where you can buy delicious homemade cheeses, breads and charcuterie. For some top quality relaxation, head to L’Instant Etoile in 1650 to make full use of the spa facilities, including a steam room, sauna and massage treatments. When is the best time to ski Les Orres? Being a high altitude, snow sure resort, with skiable terrain up to 2720m, Les Orres offers the luxury of great skiing throughout the season. If festive magic is what you’re after, head to Les Orres over Christmas and New Year for heaps of family fun. Alternatively, mid-season is a brilliant time to ski as the snow is good throughout, and it’s a lesser known resort, meaning lifts queues tend to be shorter and the slopes quieter. For the best quality skiing, hop on the TSDC Fontaines lift ski a bit of the Coqs blue run to connect to the TS4 Les Cretes lift, that will take you right up to 2700m for some cracking late season snow. Alternatively, head really high and grab the TSD6 Pousterle lift, followed by the Marmotte to 2720m, take in the inevitably spectacular views in the sun, before hitting one of the many reds to get back down for a well-deserved beer in A Grand Cabane. The tourist office are super at making sure there is always something going on, from ice-rink discos to theatre performances or events in the snow park, as well as alternative snow activities like tobogganing. Families visiting Les Orres have the immediate reassurance of its Famille Plus label, awarded by the French Tourist Board, meaning that is has been approved for providing outstanding family supporting facilities. Most accommodation here is self-catering, perfect for families who prefer to plan their own holiday and avoid the restrictions of set meal times and menus. Ideally located in the quieter 1800, the Combe d’Or apartments have brilliant slope side location, and are just up the piste from the ski-school meeting point, so are great for families, especially with little ones who don’t want to carry heavy equipment. Also close to the chairlifts, slopes and ski-school meeting point are the Terrasses du Soleil d’Or apartments, a 5 minute walk from the supermarket, bakery and restaurants. The skiing around the area is brilliant for children and learners, as there are a number of gentle greens and blues both around the resort, and up higher at around 2700m, for some practise with a view. The two ski-schools, the ESF and Ozone snowboarding allow parents who want to zoom off for a morning to do so with complete peace of mind. If your little ones are too young for ski-school, the day care facilities in both village 1800 (Club Piou Piou) and 1650 (La Farandole) offer and safe and fun environment for children, so parents can sneak off to the slopes and not worry. Alternative activities on the snow are a great way to involve the whole family, and Les Orres offers a brilliant range of them, from snowshoeing to tobogganing, as well as a whole host of events hosted by the Tourist Office. Groups choosing Les Orres as their holiday destination will really benefit from and enjoy the variety of skiing in and around the resort. Larger groups with mixed abilities will easily find runs to please all members, whilst smaller groups will benefit from the quiet slopes and shorter lift queues, making skiing together much easier. Self-catering is a great option for hands-on groups, as it allows for flexibility where meal times and menu choices are concerned. With larger accommodation, normally comes a better choice of extras like wellness facilities. If this is something your group would be interested in, please do give us a call to discuss your options. 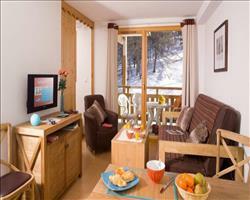 For spacious, modern apartments, have a look at the Combe d’Or option, located in the slightly quieter 1800 village, with fantastic doorstep skiing and really close to the chairlift. Built in traditional wood and stone, they won’t disappoint. For somewhere close to the village centre, as well as the slopes, check out Terrasses du Soleil d’Or , which are just 5 minutes from all the important bits, namely the bakery for daily fresh bread, the restaurants for that night off, and the bus stop for really quick and easy access to village 1650. 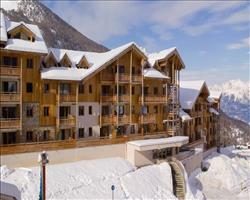 If you’re after amazing on-the-piste accommodation, you’ll find the Foret d’Or apartments at the foot of one of the main pistes in 1800, with the main chairlift just outside. Self-catering holidays can sometimes be labelled as ‘hard work’ when thinking about cooking and washing up, but the two villages have a number of great restaurants serving up a mixture of mountain classics and famous French cuisine, so it would be rude to not swerve the kitchen a couple of times during your stay! Booking holidays for groups can get hectic, so let us take the pressure off with packages including flights and transfers, channel crossings if you’re planning a road trip or accommodation only deals if you want to book travel separately. There weren’t many people there so we had loads of room and loads of empty runs. Les Orres isn’t a resort that seems to get a lot of English families, but it’s very set up for families and very popular with the French who come for weekends etc. It has very good snow, and it snowed while we were there. There are also snow cannons on the slopes but we didn’t need them! The village itself isn’t very busy but there are things you can do like ice skating, there are so many things we didn't get round to doing.